Original Source: “The Founding of St. Augustine.” In Old South Leaflets Volume IV. Boston: Directors of the Old South work. Old South Meeting House. The Lord having granted us favorable weather from the first, five days’ sailing brought us in sight of the Lanzarote Islands and Fuerte Ventura. The following Wednesday, July 5, 1565, we reached the Canary Islands, which are two hundred and fifty leagues from Cadiz, where we stopped three days to lay in a supply of wood and water. 1. The following Sunday, July 8, our fleet, composed of eight ships, under the direction of our general, left the Canary Islands, and proceeded to the Island of Dominica, which was to be conquered from the Caribbee Indians. Unfortunately, the very evening we set sail, our first galley and a patache became separated from us. For two days we coasted up and down, hoping to rejoin them, but without any success; and our admiral, seeing that we should not be able to accomplish it, gave the order for us to sail directly to Dominica, where we were to await them in case they had not arrived before us. During this voyage a shallop, or boat, commanded by Capt. Francesco Sanchez sprung a leak, and, as it got beyond the control of the crew, he asked assistance from us, but it was impossible to give him any. The pilot wishing to continue to sail with the other vessels until they should arrive at their destination, and have the leak repaired there, the captain and a soldier had recourse to their swords to oblige the pilot to return to port, being fearful lest they should be all drowned. The pilot declared himself unable to do this on account of the rough weather, so they decided to make for the cape on the south-west in order to reach the land as soon as possible.2. Thus it happened that we were obliged to leave them, which we did with deep regret and great anxiety as to what would become of them. The five vessels which remained of our fleet had a prosperous voyage the rest of the way, thanks to our Lord and His Blessed Mother. Up to Friday, the 20th, we had very fine weather, but at ten o’clock that day a violent wind arose, which by two in the afternoon had become the most frightful hurricane one could imagine. The sea, which rose to the very clouds, seemed about to swallow us up alive, and such was the fear and apprehension of the pilot and other sailors that I exerted myself to exhort my brethren and companions to repentance. I represented to them the passion of our Lord Jesus Christ, His justice and His mercy, and with so much success that I passed the night in confessing them.3. Very often the sea washed completely over the deck where we were gathered, one hundred and twenty men having no other place to go, as there was only one between-decks, and that was full of biscuit, wine, and other provisions. We were in such great danger that it was found necessary to lighten the vessel, and we threw a great many barrels of water into the sea, as well as our cooking apparatus and seven millstones which we were taking with us. Most of the reserve rigging and the great ship’s cable were cast overboard, and still the waves continued to break over us. The admiral then resolved to throw all the chests of the men into the sea, but the distress of the soldiers was so great that I felt constrained to throw myself at his feet and beg him not to do it. I reminded him that we ought to trust to the great mercy of our Lord, and, like a true Christian, he showed confidence in God, and spared the luggage. When Jesus Christ permitted the return of day, we looked at each other as at men raised from the dead, and, though our suspense during Saturday was no less than that of the preceding night, light itself was a consolation to us; but when night, however, found us again still in the same dangerous situation, we thought we must surely perish, and during this whole night I preached to the crew, and exhorted them to put their trust in God. Sunday morning came, and your Lordship can fancy how we rejoiced to see daylight once more, although the storm continued unabated all day, and until noon of the following Monday, when our Lord deigned to have compassion and mercy on us, and calmed the fury of the winds and waves.4. When the tempest arose, our five vessels were sailing in company, but during the night the hurricane was so violent that they were driven in different directions, and we lost sight of one another for three days. Finally, one morning, we saw a ship approaching which we recognized as one of our fleet, although we had at first feared it was French. We were all so tired, and our minds so confused by what we had suffered, that the pilots lost all calculations by reckoning as to what was our proper course; but, inspired by the Holy Ghost, they directed the men to steer W. S. W., and we came in sight of the Island of Desirade. 5. On Sunday, August 5th, the day of Notre Dame des Neiges, just as we were approaching the island, we were assailed by a heavy swell and a westerly gale which drove us back to the Island of Dominica, inhabited by Caribbee Indians, where we entered the harbor about nine o’clock in the evening. As soon as we had cast anchor, the captain gave orders to lower and arm the ship’s boat, which the sailors manned, and, being provided with jars, went ashore in search of water, of which we were in the greatest need. An Italian domestic whom I had went with them, and in the early morning, while searching for water by a bright moonlight, he discovered at the foot of a tree the largest and most frightful tortoise one could imagine. At the first movement it made, they thought it was a serpent or some other deadly animal, and cried to each other to fly to the shore where their boat was; but afterwards, as there were six of them, they felt ashamed of their fears, and, each taking an oar or a stick, they returned to where they had first heard the sound, and, as I have said, discovered a tortoise. Armed with their oars, they approached it and tried to turn it on its back. The animal fled towards the sea, but they were at last successful in attacking it by one leg, and were able to bring it on to the ship. It required six men next day to cut it up. The creature was a female and contained more than five hundred eggs, each about the size of a hen’s egg, and having a yolk and white, but quite round in shape. The meat, especially when roasted, looks and tastes like veal. These tortoises live principally in the sea, although they go on shore to sleep. When they are filled with eggs, as this one was, they deposit them on the ground and cover them with earth, where after a certain time the young hatch out, and then go into the sea to live. 6. On Tuesday morning the admiral fitted out the boat, in which the sailors were to go in search of wood and water, and told me that, if I wished, I might accompany them, although he advised me to be very careful. Anxious to go ashore, I did not stop to consider all the danger to which I might be exposed. I called my Italian servant and directed him to take a half dozen soiled shirts and some other linen, and gave him a piece of soap with which to wash them when we got on land, which he did very well. I had fifty jars filled with excellent water, in the forest, and then sent off the boat. While my servant and four other men were busy washing the clothing, I climbed upon some rocks on the seashore and amused myself collecting shells, of which there were a great number, when, on raising my eyes, I perceived three entirely naked men descending a hill. As we were in an enemy’s country, I thought they must of course be Caribbees, and ran as fast as I could to join my companions. Each armed with a half dozen stones, we then went to meet the men. When we came within reach of their voices, we perceived that they were some of our own people, which, considering the condition we thought ourselves in, gave me the greatest pleasure. The explanation of this adventure is this: Only a certain number of us were permitted by the admiral to go ashore, but the poor wretches who remained behind, having also the greatest desire to land, five soldiers agreed to swim after and join us. The distance was greater than it appeared, however, and, the current being very rapid, two out of the five were drowned. The other three crossed the mountain to where I was, and, as they wore no clothing, I thought it must be an ambuscade of Caribbees.7. I had about a hundred Peru jars filled with fresh water, and a large quantity of wood gathered, and at about four o’clock we returned to the ship. Just then so fresh a breeze sprung up that at daylight on Wednesday we found ourselves at the Island of Montserrat, thirty-five leagues from there. It is said that from the Canary Islands to Dominica there are about eight hundred leagues sailing. Farther on are a great many other islands which bear the names of different saints, Guadaloupe and the Virgin Islands. This group appears to be about two hundred leagues in circumference, but the ground is very stony and uninhabitable. 8. On Thursday, August 9, about noon, we came in sight of Porto Rico, but at nightfall, the pilot being fearful lest we should run aground on the sand-banks which surround the island and its harbor, ordered all the sails to be brailed up. Next morning; however, the breeze having stiffened a little, we again set sail, and entered the port on Friday, St. Lawrence’s Day, at about three in the afternoon. On entering the harbor, we discovered our first galley anchored there, with the San Pelago, which had become separated from us in a storm. Loud cries of joy resounded on all sides, and we thanked the Lord that He had permitted us to find each other again, but it would be impossible for me to tell how it all happened. The captains and ensigns came immediately to see us, and I regaled them with some confectionery and other things which I had brought with me. That same day I went ashore with the admiral, and we visited the general, who received us handsomely and with great demonstrations of affection. In the evening, seeing that I did not present myself at supper because he had not invited me, he sent for me. On the day following he gave me quarters in a beautiful house, and cordially invited me to dine with him, for which, of course, I returned my thanks. We remained four days in port, during most of which time it rained. On Wednesday, the r5th, about ten o’clock, more than thirty men deserted and concealed themselves around the harbor, among them three of the seven priests who accompanied the expedition. It was impossible to find them, dead or alive, which distressed the general very much, and me, too, as it added greatly to my labors. At this seaport I was offered a chaplaincy where I should have received a peso for every mass said, and I should have had plenty to do all the year round, but I feared to accept, lest I should be talked about as the others were, and then it is not a city where one is likely to receive promotion ; and, besides, I wanted to see if, by refusing a personal benefit for the love of Jesus, He would not grant me a greater, since it is my desire to serve our Lord and His blessed mother. The rich persons in that country have made their money in cattle, some of the wealthy land-owners having twenty to thirty thousand cows, and others as many mares, each worth only about forty of base coin, or about one hundred and twenty Spanish reals. The mares are not worth more, because they do not know how to make use of them, unless occasionally to draw loads or produce colts. As to the cattle, only their hides are profitable, each hide being worth eleven or twelve reals of that country. I mention these things, because they wished to persuade me to remain in that city. Señor VALVERDE and I paid eight reals for an azumbre of wine, and even at that price it was not very good. We replenished our little stock of provisions for the voyage across, with such things as excellent salt meat, oranges, lemons, sweet potatoes, sugar-canes, and a dozen beef’s tongues, and salt ribs. We took these precautions, because on our outward trip we had learned by experience what one is likely to suffer at sea.9. It appears that the storm above described had injured also our first galley, which, being near the shore when the hurricane began, suffered so considerably that all the ship’s company made their last confessions, and expected every minute to be their last. A severe gust of wind snapped off their foremast, and blew it overboard with the sail and rigging; and, as many of the ropes were fastened to the sheets, it caused the ship to lean so that twice they saw their topmast dip under the waves. At the same time parts of the top-sides were broken, as well as the mainmast. The ship’s company being unable any longer to control the sails, and finding themselves likely to perish, gave themselves up to the will of the waves, until God, in His good mercy, permitted them to reach this haven, where they repaired their disasters as best they could.10. In the port of St. John’s of Porto Rico the general purchased twenty-four horses and a ship to transport fifty men, whom the King had commanded to be taken from this island. The very day we set sail, this ship sprung aleak, and the danger of foundering was so imminent that, in order to save the men, it became necessary to lighten her by throwing overboard a large quantity- of merchandise. Seeing that this produced but little effect, it became necessary also to throw over the horses. Twenty-three were either lost in this way or died during the voyage, so that but one arrived in Florida. The same day the general sent a large ship to St. Domingo, with orders to take on board the four hundred men who, by his Majesty’s orders, had been assembled there, and have them join us with all haste.11. Before our fleet left Spain, three caravels had been sent out by his Majesty’s directions, as despatch-boats, each at a different time, to transmit to St. Domingo and to Havana his Majesty’s orders in regard to what should be done on our arrival. The second of these caravels took with her a great many sealed despatches concerning arrangements to be made, and a great many valuable objects. When she arrived off Mona Island, which forms already a part of St. Domingo, she was attacked, and compelled to surrender to a French vessel,-one of those who were in our neighborhood. The enemy boarded her, possessed themselves of all her papers, read the plans for the conquest of Florida, took off all the other things they saw fit to take, and then told the ship’s company to go as fast as they could to St. Domingo to notify their countrymen, but that they hoped to be there as soon as the caravel; and with this they left them.12. On Friday, August 17, about four in the afternoon, we arrived in sight of St. Domingo. Our general, trusting to good luck and the mercy of God, instantly ordered the admiral’s ship to proceed northward, and pass through a very dangerous channel, which no navigator had as yet explored. Although the admiral, as well as all of us, was very much distressed by this order, he could not do otherwise than obey the commanding general. At the time we entered the strait, the waves were so high and the swell so strong we thought we were about to perish, the danger being caused by the surge which we had to brave, and yet resist. The admiral told me to encourage the soldiers with some good prayers and exhortations, and they did become calm, although during the whole night we were exposed to this danger.13. Saturday, the 18th, daylight having reappeared, we took courage ; but, as we were sailing along, well out at sea, we all at once saw breakers ahead. All the pilots hastened to throw their sounding-lines, and find out if it would do to proceed in the course our manoeuvre demanded. In some places they found four fathoms of water, and in others less. Two hours before nightfall we discovered a low desert island, named Aguana. Providence permitted us to come near these banks and this island by daylight, so that we could see and avoid their dangers; for, had we approached them by night, we must surely have perished. In consideration of the great danger of our surroundings, and supposing that none of our pilots were familiar with those parts, we resolved to reef our sails, and not venture to proceed by night, lest we should be wrecked. Sunday morning, the 19th, at daybreak, the first ship which set sail was the flag-ship, on which I was, since the pilot on this ship knew his duty perfectly. The first galley joined us, and the general was spoken to, and told that we were pursuing a bad course; but he only reiterated the orders to the captains and pilots to continue in the route which was laid out for them. All obeyed, although very unhappy about the frightful danger to which the constantly appearing breakers exposed them. That day we perceived another low island, called Capuana, uninhabited, like the other, and surrounded by dangerous shoals and rocks. God permitted us to pass it by day, and thus avoid its perils. At nightfall the flag-ship and the first galley approached each other, and the general had a long interview with the admiral and his pilot, who explained to him the uncertainty of their being able to continue their voyage by this route. Persistently obstinate, however, the general directed the captain and pilot to navigate ahead of the first galley, to avoid the dangers of shallow waters.14. During the following night all the ships, of which all the officers and crews were dissatisfied to be navigating in unknown waters, profited by the darkness to brail up their sails and fall behind the first galley, in order that they might shield themselves from danger, by keeping in her wake.15. Monday, the 20th, found us all at anchor at break of day, for the galley, like the rest, fearful of the shallow waters, had cast anchor at midnight, and when it became quite light we beheld another low, fiat island right ahead of us. After passing this place, navigation became easier, so far as shoals were concerned, for we met them less frequently, which was somewhat encouraging. Sunday morning a boat from the galley came alongside of us with men to visit some of my friends. We learned from them that the (governor) general had made eight new captains, with their ensigns, sergeants, etc., besides the four o had accompanied us from Spain. Each company was to be composed of fifty men and a certain number of horsemen to scout the country. Every one was well pleased to learn this piece of news.16. On the same day, about nine o’clock in the morning, the admiral approached the galley to salute, according to custom, when the general directed the captain to distribute arms to all the soldiers and hold them in readiness for action. Reflecting on the determination which lie had shown in regard to the navigation, I felt sure that the general knew perfectly well what he was about, but did not wish to be communicative. Your Lordship will remember that, when the fleet was in on in Spain, I went to see the captain-general at the harbor of St. Mary, and, as I told you, he shoved me a letter from his Royal Highness PHILIP II, signed with his name. In this letter his Majesty told him that on bray zo some ships had left France carrying seven hundred men and two hundred women. As I have stated, we learned at St, John’s of Porto Rico that our despatch-boat had been captured. This fact, joined to the reflection that our fleet was much injured by the storm, and that of the ten vessels which left Cadiz only four remained, besides the one bought at the last port to transport the horses and troops-all this made it evident to our captain-general, a man of arms, that the French would likely be waiting for him near the harbors, a little farther on ; that is, off Monte Christi, Havana, and the Cape of Las Canas, which lie on the same side, and precisely on our route to Florida. This was all the more to be expected since the French had come in possession of our plan to unite our forces at Havana. Not wishing, however, to encounter the French, having now lost our ships, and having but feeble means of defence, the general decided to take a northerly course, and pursue a new route, through the Bahama Channel, leaving the enemy to the windward. When I suggested this route to the admiral and the pilot, they said it was important and necessary to abandon the usual route, by way of Havana. Following this dangerous navigation, the Lord permitted the admiral to arrive safely in port on Sunday, the 20th of August. We saw two islands, called the Bahama Islands. The shoals which lie between them are so extensive that the billows are felt far out at sea. The general gave orders to take soundings. The ship purchased at Porto Rico got aground that day in two and a half fathoms of water. At first, we feared she might stay there; but she soon got off and came to us. Our galley, one of the best ships afloat, found herself all day in the same position, when suddenly her keel struck three times violently against the bottom. The sailors gave themselves up for lost, and the water commenced to pour into her hold. But, as we had a mission to fulfil for Jesus Christ and His blessed mother, two heavy waves, which struck her abaft, set her afloat again, and soon after we found her in deep water, and at midnight we entered the Bahama Channel. 17. On Saturday, the 25th, the Captain-general (Menendez) came to visit our vessel and get the ordnance for disembarkation at Florida. This ordnance consisted of two rampart pieces, of two sorts of culverins, of very small caliber, powder and balls; and he also took two soldiers to take care of the pieces. Having armed his vessel, he stopped and made us an address, in which he instructed us what we had to do on arrival at the place where the French were anchored. I will not dwell on this subject, on which there was a good deal said for and against, although the opinion of the general finally prevailed. There were two thousand Frenchmen in the seaport into which we were to force an entrance. I made some opposition to the plans, and begged the general to consider that he had the care of a thousand souls, for which he must give a good account. Then followed a fine address, which I shall not repeat here, as it would make my report too long. Please the Lord and the Blessed Virgin, I will, however, report it on my return.18. On Monday, August 27, while we were near the entrance to the Bahama Channel, God showed to us a miracle from heaven. About nine o’clock in the evening a comet appeared, which showed itself directly above us, a little eastward, giving so much light that it might have been taken for the sun. It went towards the west?that is, towards Florida?and its brightness lasted long enough to repeat two Credos. According to the sailors, this was a good omen. 19. On Tuesday, the 28th, we had a calm more dead than anything we had yet experienced while at sea. Our vessel was about one and a half leagues from the first galley and the other vessels. We were all tired, and especially I, from the praying to God to give us weather which should put an end to all trials and disappointments. About two o’clock he had pity on us, and sent so good a wind that we came under full sail to rejoin the galley. One thing happened which I regard as miraculous. 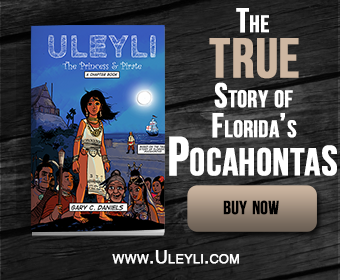 While we were becalmed, and after we had joined the other vessels, none of the pilots knew where we were, some pretending we were as much as a hundred leagues from Florida. However, thanks to God and the prayers of the Blessed Virgin, we soon had the pleasure of seeing land. We steered in that direction, anchored near a point of land, and found ourselves actually in Florida, and not very far distant from the enemy, which was for us an occasion of great joy. That evening our general assembled the pilots on the galley to discuss what was to be done. Next day, the 29th, at daylight, the galley and all the other ships weighed anchor, and coasted along in search of the enemy or a harbor favorable for disembarking.20. On Monday, the 30th of August, we were assailed by bad weather, which obliged us to anchor. For four days contrary winds continued to blow, or else it was so calm we could not move, during all of which time we were at anchor, about a league and a half from the shore. The captain-general, seeing that neither the pilots nor the two Frenchmen whom we had taken prisoners, and who belonged to the French colony, could give us any information in regard to the port; and the coast being so flat that we could only recognize a few objects, the general, under these circumstances, decided to send ashore fifty arquebusiers, with some captains. They built fires in order to excite the curiosity of the Indians, and attract them; but they were so stupid that they paid no attention to us, and none came to see us. Our people then decided to penetrate the interior; and after having gone four leagues, they arrived at a village of Indians, who kindly received them, gave them food in abundance, embraced them, and then asked them for some of their things, and the soldiers were generous enough to make them a number of presents. In return the natives gave them two pieces of gold, of low standard, but it showed that they had some, and were in the habit of giving it in exchange. The Frenchmen whom we had with us told us they had been in communication with them for a long time. The Indians wanted the soldiers to pass the night with them, in order that they might feast therm; but the latter declined their offers, being anxious to report the good news to our captain-general. As soon as he had learned the news, he resolved to disembark on Saturday morning, September 1st, and go among these Indians. He took with him a quantity of linen, knives, mirrors, and other little things of that sort, to gain their good will, and get some information as to where the French were. One of the Frenchmen of whom I have spoken understood their language. They told us we had left the French about five leagues behind us, precisely at the same spot to which God had conducted us when we arrived in sight of land; but we could not find them, because we had not sent any one ashore.21. On Tuesday, the 4th, the fleet left the place of which I have been speaking, and we took a northerly course, keeping all the time close to the coast. On Wednesday, the 5th, two hours before sunset, we saw four French ships at the mouth of a river. When we were two leagues from them, the first galley joined the rest of the fleet, which was composed of four other vessels. The general concerted a plan with the captains and pilots, and ordered the flag-ship, the San Pelayo, and a chaloupe to attack the French flag-ship, the Trinity, while the first galley and another chaloupe would attack the French galley, both of which vessels were very large and powerful. All the ships of our fleet put themselves in good position; and the troops were in the best of spirits, and full of confidence in the great talents of the captain-general. They followed the galley; but, as our general is a very clever and artful officer, he did not fire, nor seek to make any attack on the enemy. He went straight to the French galley, and cast anchor about eight paces from her. The other vessels went to the windward, and very near the enemy. During the maneuvers, which lasted until about two hours after sunset, not a word was said on either side. Never in my life have I known such stillness. Our general inquired of the French galley, which was the vessel nearest his, “Whence does this fleet come?” They answered, “From France.” “What are you doing here?” said the Adelantado. “This is the territory of King Philip II. I order you to leave directly; for I neither know who you are nor what you want here.” The French commander then replied, “I am bringing soldiers and supplies to the fort of the King of France.”22. He then asked the name of the general of our fleet, and was told, “Pedro Menendez de Aviles, Captain-general of the King of Spain, who have come to hang all Calvinists [viz., Huguenots] I find here.” Our general then asked him the name of his commander, and he replied, “Lord Gaston.” While this parleying was going on, a long-boat was sent from the galley to the flag-ship. The person charged with this errand managed to do it so secretly that we could not hear what was said; but we understood the reply of the French to be, “I am the admiral,” which made us think he wished to surrender, as they were in so small a force. Scarcely had the French made this reply, when they shipped their cables, spread their sails, and passed through our midst. Our admiral, seeing this, followed the French commander, and called upon him to lower his sails, in the name of King Philip, to which he received an impertinent answer. Immediately our commander gave an order to discharge a small culverin, the ball from which struck the vessel amidships. and I thought she was going to founder. We gave chase, and some time after he again called to them to lower their sails. “I would sooner die first than surrender!” replied the French commander. The order was given to fire a second shot, which carried off five or six men; but, as these miserable devils are very good sailors, they maneuvered so well that we could not take one of them; and, notwithstanding all the guns we fired at them, we did not sink one of their ships. We only got possession of one of their large boats, which was of great service to us afterwards. During the whole night our flag-ship (the San Pelayo)and the galley chased the French flag-ship (the Trinity) and galley.23. Wednesday morning, September 5th, at sunrise, so great a storm arose that we feared we should be shipwrecked; and, as our vessels were so small, we did not dare to remain on the open sea, and regained the shore; that is, three of our vessels anchored at about a league and a half from it. We had double moorings, but the wind was so strong that one of them broke loose. We prayed the Lord to spare the others, for we could not have prevented them from being driven onto the coast and lost. As our galley was a large vessel, and busy following up the enemy, she could not come to our assistance. So we felt ourselves in danger of being attacked. The same evening, about sunset, we perceived a sail afar off, which we supposed was one of our galleys, and which was a great subject of rejoicing; but, as the ship approached, we discovered it was the French flag-ship, which we had fired at the night before. At first we thought she was going to attack us; but she did not dare to do it, and anchored between us and the shore, about a league from us. That night the pilots of our other ships came on board, to consult with the Admiral as to what was to be done. The next morning, being fully persuaded that the storm had made a wreck of our galley, or that, at least, she had been driven a hundred leagues out to sea, we decided that as soon as daylight came we would weigh anchor, and withdraw in good order, to a river (Seloy) which was below the French colony, and there disembark, and construct a fort, which we would defend until assistance came to us.24. On Thursday, just as day appeared, we sailed towards the vessel at anchor, passed very close to her, and would certainly have captured her, when we saw another vessel appear on the open sea, which we thought was one of ours. At the same moment, however, we thought we recognized the French admiral’s ship. We perceived the ship on the open sea: it was the French galley of which we had been in pursuit. Finding ourselves between these two vessels, we decided to direct our course towards the galley, for the sake of deceiving them and preventing them from attacking us, so as not to give them any time to wait. This bold maneuver having succeeded, we sought the river Seloy and port, of which I have spoken, where we had the good fortune to find our galley, and another vessel which had planned the same thing we had. Two companies of infantry now disembarked: that of Captain Andres Soyez Patino, and that of Captain Juan de San Vincente, who was a very distinguished gentleman. They were well received by the Indians, who gave them a large house belonging to a chief, and situated near the shore of a river. Immediately Captain Patino and Captain San Vincente, both men of talent and energy, ordered an entrenchment to be built around this house, with a slope of earth and facines, these being the only means of defense possible in that country, where stones are nowhere to be found. Up to today we have disembarked twenty-four pieces of bronze guns of different calibers, of which the least weighed fifteen hundred weight. Our fort is at a distance of about fifteen leages from that of the enmy (Fort Carolin). The energy and talents of those two brave captains, joined to the efforts of their brave soldiers, who had no tools with; which to work the earth, accomplished the construction of this fortress of defense; and, when the general disembarked, he was quite surprised with what had been done.25. On Saturday, the 8th, the general landed with many banners spread, to the sound of trumpets and salutes of artillery. As I had gone ashore the evening before, I took a cross and went to meet him, singing the hymn Te Deum laudamus. The general marched up to the cross, followed by all who accompanied him, and there they kneeled and embraced the cross. A large number of Indians watched these proceedings and imitated all they saw done. The same day the general took formal possession of the country in the name of his Majesty, and all the captains took the oath of allegiance to him, as their general and governor of the country. When this ceremony was ended, he offered to do everything in his power for them, especially for Captain Patino, who during the whole voyage had ardently served the cause of God and of the King, and, I think, will be rewarded for his assiduity and talents in constructing a fort in which to defend ourselves until the arrival of help from St. Domingo and Havana. The French number about as many as we do, and perhaps more. My advice to the general was not to attack the enemy, but to let the troops rest all winter and wait for the assistance daily expected; and then we may hope to make a successful attack.26. God and the Holy Virgin have performed another great miracle in our favor. The day after our general came into the fort, he told me he was very much annoyed that his galley and another vessel were anchored about a league out at sea, and were not able to enter the harbor on account of the sandbanks. He felt uneasy, and feared the French would capture or ill-treat them. As soon as this idea took possession of him, he left with about fifty men, to go on board another galley. He gave the order for three of the ship’s boats, which were anchored in the river, to go and get the food and troops from on board the galley. The next day our ship went to sea loaded with provisions, and one hundred men besides, and, when about half a league from the bar, it became so becalmed that it could not advance at all. So they cast anchor, and passed the night in that place. The next morning, as the tide rose, they weighed anchor, and, as daylight advanced, they found themselves astern of two French vessels that had been watching them. The enemy prepared immediately to attack us; but, when our people recognized the French, they addressed a prayer to Our Lady of Utrea, begging for her to send a little wind, for the French were already quite close upon us. One would have said that the spirit of Our Lady immediately descended upon the ship, for the wind freshened, blowing directly toward the channel, so that our galley could take refuge. The French soon followed us; but, as the water is very shallow on the bar, their large ships could not pass over, and our people and provisions got safely into port.27. Under these circumstances, God granted us two great favors. The first was that on the same evening, after we had landed our troops and provisions, the two vessels sailed away at midnight without being seen by the enemy. One went to Spain, and the other to Havana, so that neither was captured. The second favor, and that by which God rendered us a still greater service, happened the next day. A great hurricane came up, and was so severe that, I think, almost all of the French vessels must have been lost; for they were assailed on the most dangerous part of the coast. Our general was very bold in all military matters, and a great enemy of the French. He immediately assembled his captains and planned an expedition to attack the French settlement and fort on the river with five hundred men; and, in spite of the opinion of a majority of them, and of my judgment and another priest, he ordered his plan to be carried out. Accordingly, on Monday, September 17, he set out with five hundred men, well provided with fire-arms and pikes, each soldier carrying with him a sack of bread and a supply of wine for the journey. They also took with them two Indian chiefs, who were the implacable enemies of the French, to serve as guides.28. In a letter received from the captain-general today, the 19th, he wrote me Athat the very shallowest of the streams which they forded reached up to the knees; that he passed through very dense forests, and tomorrow, the 20th (Thursday), he hoped to attack the enemy’s fort at daybreak. @ His courage and great zeal make me hope that he will succeed; but he ought to have been a little less eager to carry out his projects, which would have really more advanced the service of his Majesty. Since the departure of the troops, we have suffered the worst weather and the most horrible tempests that I ever saw. May his Divine Majesty be with us and protect us, for Heaven knows we have need of it. Yesterday evening, Wednesday, the 19th, we sent from the fort twenty men laden with provisions?bread, wine, and cheese?but the rain has fallen in such abundance that I am not sure they have been able to join the general and his army. I hope God, however, will do all he can for us, which will enable us to propagate His religion, and destroy the heretics.29. This morning, Saturday, the 22nd, just after I had finished the mass of Our Lady, the admiral, at our request, sent some soldiers to fish, that we priests might have something to eat, it being a fast-day. Just as they had arrived at the place for fishing, and were going to throw out their nets, they perceived a man advancing towards them. He unfurled a white flag, which is a sign of peace, when our men surrounded and captured him. He proved to be a Frenchman, one of our enemies, so they made him a prisoner, and brought him to our admiral. The man, thinking we were going to hang him, shed tears, and appeared to be in great distress. I asked him if he were a Catholic, and he told me he was, and recited some prayers. So I consoled him, and told him not to fear anything, but to answer all questions put to him with frankness, which he promised to do. 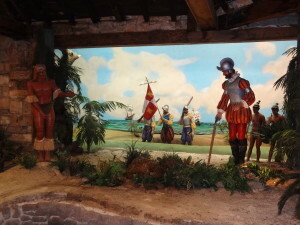 He said there were about seven hundred men in the fort (Carolin, on the river May), of which one-third were Calvinists, and two priests, who preached the Calvinist doctrines, and in camp eight or ten Spaniards, three of whom were found among the Indians, quite naked, and painted like the natives, who had been wrecked on the coast; and, as no vessel had come into the country for a long time, they had remained with the Indians, some of whom had joined the French, whose fleet had arrived twenty days before.30. On Monday, September 24th, about nine o’clock in the morning, the admiral came into port with his frigate, and, as soon as I recognized him, I had the bells rung and great rejoicing made in the camp.31. An hour after he arrived, we saw a man approaching with loud cries. I was the first to run to him and get the news. He embraced me with transport, crying, “Victory! Victory! the French fort (Carolin)is ours!” I promised him the gift due to the bearer of good news, and have given him the best I was able to give. I have related how our brave general was determined, in spite of the opinions of many of his officers, to attack the French by land with five hundred men; but, as the enterprise we are engaged in is for the cause of Jesus Christ and His Blessed Mother, the Holy Spirit has enlightened the understanding of our chief, so that everything has turned to our advantage, and resulted in a great victory. He has shown an ability and energy unequaled by any prince in the world. He has been willing to sacrifice himself, and has been sustained by his captains and his soldiers, whom he has encouraged by his valor and his words more than by any distribution of rewards or other inducements, so that every soldier has fought like a Roman.32. I have previously stated that our brave captain-general set out on the 17th of September with five hundred arquebusiers and pikemen, under the guidance of two Indian chiefs, who showed them the route to the enemy’s fort. They marched the whole distance until Tuesday evening, the 18th of September, 1565, when they arrived within a quarter of a league of the enemy’s fort (Carolin), where they remained all night up to their waists in water. 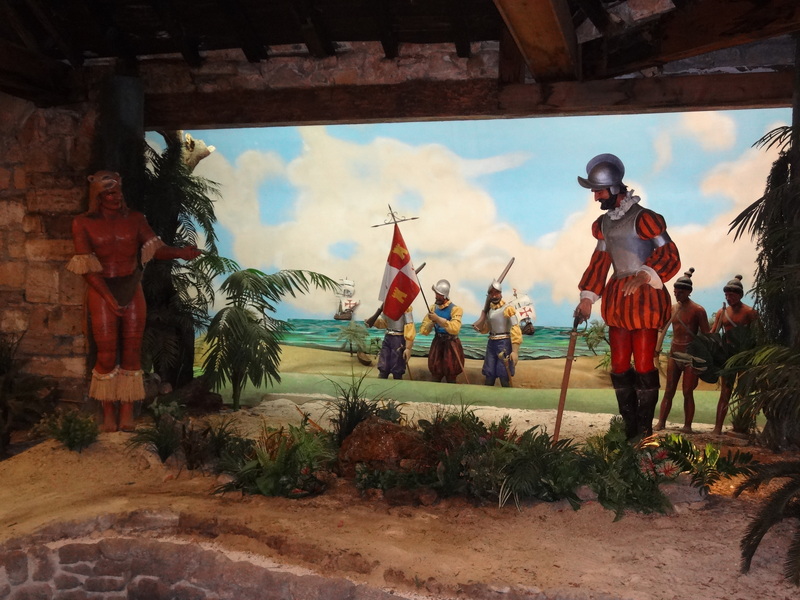 When daylight came, Captains Lopez, Patino, and Martin Ochoa had already been to examine the fort; still, when they went to attack the fort, a greater part of the soldiers were so confused they scarcely knew what they were about.33. On Thursday morning our good captain-general, accompanied by his son-in-law, Don Pedro de Valdes and Captain Patino, went to inspect the fort. He showed so much vivacity that he did not seem to have suffered by any of the hardships to which he had been exposed, and, seeing him march off so brisk, the others took courage, and without exception followed his example. It appears the enemy did not perceive their approach until the very moment of the attack, as it was very early in the morning and had rained in torrents. The greater part of the soldiers of the fort were still in bed. Some arose in their shirts, and others, quite naked, begged for quarter; but, in spite of that, more than one hundred and forty were killed A great Calvinist cosmographer and magician was found among the dead. The rest, numbering about three hundred, scaled the walls, and either took refuge in the forest or on their ships floating in the river, laden with treasures, so that in an hour the fort was in our possession, without our having lost a single man, or even had one wounded. There were six vessels on the river at the time. They took one brig, and an unfinished galley and another vessel, which had been just discharged of a load of rich merchandise, and sunk. These vessels were placed at the entrance to the bar to blockade the harbor, as they expected we would come by sea. Another, laden with wine and merchandise, was near the port. She refused to surrender, and spread her sails, when they fired on her from the fort, and sunk her in a spot where neither the vessel nor cargo will be lost. The taking of this fort gained us many valuable objects, namely, two hundred pikes, a hundred helmets, a quantity of arquebuses and shields, a quantity of clothing linen, fine cloths, two hundred tons of flour, a good many barrels of biscuit, two hundred bushels of wheat, three horses, four asses, and two she-asses, hogs, tallow, books, furnace, flour-mill, and many other things of little value. But the greatest advantage of this victory is certainly the triumph which our Lord has granted us, and which will be the means of the Holy Gospel being introduced into this country; a thing necessary to prevent the loss of many souls.34. On Monday, the 24th September, 1565, at the vesper hour, our captain-general arrived with fifty foot-soldiers. He was very tired, as well as those who accompanied him. As soon as I learned that he was coming, I ran to my room, put on a new cassock, the best I possessed, and a surplice; and, taking a crucifix in my hand, I went a certain distance to receive him before he arrived in port; and he, like a gentleman and a Christian, knelt, as well as those who came with him, and returned a thousand thanks for the great favors he had received from God. My companions and I walked ahead in a procession, singing the Te Deum laudamus, so that our meeting was one of the greatest joy. Our general’s zeal for Christianity is so great that all his troubles are but repose for his mind. I am sure that no merely human strength could have supported all that he has suffered; but the ardent desire which he has to serve the Lord in destroying the Calvinist heretics, the enemies of our holy Catholic religion, causes him to be less sensible of the ills he endured.35. On Friday, the 28th September, and while the captain-general was asleep, resting after all the fatigues he had passed through, some Indians came to camp, and made us understand by signs, that on the coast toward the south there was a French vessel which had been wrecked. Immediately our general directed the admiral to arm a boat, take fifty men, and go down the river to the sea, to find out what was the matter. About two o’clock the captain-general sent for me, and as he is very earnest, especially about this expedition, he said, “Mendoza, it seems to me I have not done right in separating myself from those troops.” I answered, “Your Lordship has done perfectly right; and, if you wanted to undertake a new course, I and your other servants would oppose it, and shield you from the personal dangers to which you would be exposed.” And, notwithstanding I sought to gain him over by such speeches, he would not abandon his project, but told me, in a decided tone, that he wished to set out, and that he commanded me and the captains who remained at the port to accompany him. He said there should be in all twelve men to go in a boat, and two of them Indians, who would serve as guides. We set off immediately to descend the river to the sea, in search of the enemy; and, to get there, we had to march more than two leagues through plains covered with brush, often up to our knees in water, our brave general always leading the march.36. When we had reached the sea, we went about three leagues along the coast in search of our comrades. It was about ten o’clock at night when we met them, and there was a mutual rejoicing at having found each other. Not far off we saw the camp fires of our enemies, and our general ordered two of our soldiers to go and reconnoiter them, concealing themselves in the bushes, and to observe well the ground where they were encamped, so as to know what could be done. About two o’clock the men returned, saying that the enemy was on the other side of the river, and that we could not get at them. Immediately the general ordered two soldiers and four sailors to return to where we had left our boats, and bring them down the river, so that we might pass over to where the enemy was. Then he marched his troops forward to the river, and we arrived before daylight. We concealed ourselves in a hollow between the sand-hills, with the Indians who were with us; and, when it came light, we saw a great many of the enemy go down the river to get shell-fish for food. Soon after we saw a flag hoisted, as a war-signal. Our general, who was observing all that, enlightened by the Holy Spirit, said to us, “I intend to change these for those of a sailor, and take a Frenchman with me (one of those whom we had brought with us from Spain), and we will go and talk with these Frenchmen. Perhaps they are without supplies, and would be glad to surrender without fighting.”37. He had scarcely finished speaking before he put his plan into execution. As soon as he had called to them, one of them swam towards and spoke to him; told him of their having been shipwrecked, and the distress they were in; that they had not eaten bread for eight or ten days; and, what is more, stated that all, or at least the greater part of them, were Calvinists. Immediately the general sent him back to his countrymen, to say they must surrender, and give up their arms, or he would put them all to death. A French gentleman, who was a sergeant, brought back the reply that they would surrender on condition their lives should be spared. After having parleyed a long time, our brave captain-general answered “that he would make no promises, that they must surrender unconditionally, and lay down their arms, because, if he spared their lives, he wanted them to be grateful for it, and, if they were put to death, that that there should be no cause for complaint.”38. Seeing that there was nothing else left for them to do, the sergeant returned to the camp; and soon after he brought all their arms and flags, and gave them up to the general, and surrendered unconditionally. Finding they were all Calvinists, the captain-general ordered them all put to death; but, as I was a priest, and had bowels of mercy, I begged him to grant me the favor of sparing those whom we might find to be Christians. He granted it; and I made investigations, and found ten or twelve of the men Roman Catholics, whom we brought back. All the others were executed, because they were Calvinists and enemies of our Holy Catholic faith. All this took place on Saturday (St. Michael’s Day), September 29, 1565.39. I, Francisco Lopez de Mendoza Grajales, Chaplain of His Lordship, certify that the foregoing is a statement of what actually happened.40.